Over the past twenty-five years major changes have occurred in early music and recorder playing in particular. Aside from the fact that early music is now considered an established and legitimate field of artistic endeavor and that there has been a proliferation of ensembles devoted to it, recorder playing, both professional and amateur, has reached relative levels of unprecedented technical and interpretive skill. When I became MPRO�s music director in January of 1988 these changes were already in progress. The challenge I faced was clearly articulated in a statement by one of the orchestra�s members in February of 1987: ��many of us reach a skill level where the orchestra ceases to offer much challenge. We continue to hear only the level of quality we first heard but which no longer inspires us. �I want MPRO to find a way to make me want to continue to work to improve my playing. I want my abilities to play with some refinement to be echoed and reinforced by others...I want to be further educated�we need to find a way to maintain the challenge and the fun of MPRO for a much wider range of skillfulness.� While I came upon this quote only quite recently, the sentiment expressed was identical to the major issue I saw facing MPRO when I became its director. The question was how to keep the more advanced players interested in continuing with the orchestra and yet not overwhelm those less advanced or just starting to play the recorder. The orchestra needed to serve all of its members, and the solution had to take them all into account. In 1988, MPRO was a well-established organization, and some of its members had been with the orchestra from its inception. It was clear that any solution to this issue had to begin within the existing structure of MPRO. The most obvious starting point was the music I would choose. It had to be attractive enough to hold the interest of the more advanced players and still be within the technical capabilities of those who were not at this level. It had to feature a wide variety of periods and styles. It had to include, when possible, instruments other than recorders, such as double reeds and percussion. And it had to show the orchestra to best advantage. Next, intonation, articulation and ensemble technique had to be addressed at each meeting. And, finally, a culture of professionalism had to be instilled in the membership. This did not necessarily mean professional technique but rather a basic understanding of how to perform the music, being well enough prepared to avoid making simple mistakes, taking responsibility for thoroughly learning a part and being aware of how the various parts of a composition fit into the overall musical framework. This was the focus during my first season with the orchestra. More, however, had to be done in terms of providing all the members of the orchestra with new and musically rewarding performing opportunities that would not only sustain their interest in MPRO but also increase their overall playing level. 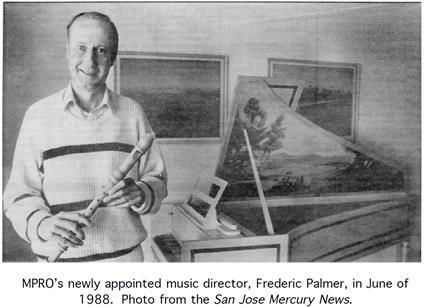 During the following 1988-1989 season, I arranged for a collaboration with the Foothill College Renaissance Singers and Palo Alto Unitarian Church Choir to give two performances involving antiphonal music for recorders and voices. This lead to several other successful performances with Bay Area vocal ensembles, including the Congregational Oratorio Society, the Wykeham Singers, the Palo Alto Madrigal Singers and the California State University, East Bay Singers as well as its Oratorio Society. It was also during that season that I embarked on presenting new works for recorders by Bay Area composers with a performance of The Long Voyage by Nancy Bloomer Deussen. This continued over the years with compositions by Mari Kermit-Canfield, Stan McDaniel, Glen Shannon and some that I had written. During its 1989-1990 season, the orchestra�s scope of repertoire was further increased with the engagement of professional soloists, the first of whom was Susan Witt of the San Francisco Opera Chorus. Subsequent professional soloists included harpist Janice Ortega, cornettist Joyce Johnson Hamilton and oboist Nicholas Vigil. It was also in that season that MPRO performed at Mission San Jose in Fremont. This was followed over the years by performances of the orchestra in several other locations throughout the Bay Area including California State University East Bay in Hayward, the Lesher Center for the Arts in Walnut Creek and the Berkeley Festival & Exhibition. The orchestra has also appeared many times on the Palo Alto public access television channel. During the 1990-1991 season, I began offering the advanced players in MPRO the opportunity to perform more challenging parts by programming selections for the orchestra that called for recorder soloists. The 1994-1995 season saw collaborations with two instrumental groups, the South Bay Recorder Society and the Oriana Consort of viols, and once again the repertoire and performing experience for the orchestra was expanded. Following this season several other instrumental ensembles gave performances with MPRO including Gabrieli West, the Palo Alto Chamber Orchestra and the Young Performers� String Orchestra. As MPRO�s performing opportunities, repertoire and overall playing level expanded I found it increasingly necessary to tailor the music I chose to the specific needs of the orchestra. This first resulted in an increasing number of selections that I arranged to make optimum use of MPRO�s musical resources and those of guest artists and ensembles that performed with it. Next was the increasing use of keyboard and often a bass instrument to provide the orchestra with a continuo for baroque selections. Most recently was the use of timpani for arrangements of works originally calling for this percussion instrument. All of this gave me the opportunity to develop techniques of recorder orchestration that made it possible for an ever-increasing number of new transcriptions that were faithful to the sound of the original works. The outcome has been an orchestral timbre for MPRO that is distinct from other recorder orchestras. MPRO�s activities encompassed more than meetings and concerts. Workshops were also an important component of the orchestra�s offerings, not only because of their educational value but also the exposure that they gave MPRO throughout the Bay Area recorder community and as a source of income. Here too, I felt that the scope of workshops had to be expanded in order to better serve the orchestra. Prior to my becoming MPRO�s music director, most of its workshops featured local instructors. In order to broaden the appeal of these workshops and widen their range of topics and teaching styles I felt it was necessary to engage prominent recorder professionals from around the United States as well as from foreign countries. These eventually included Aldo Abreu, Vicki Beckman, Clea Galhano, Patrick O�Malley and Tom Zajac. At the same time, the orchestra would continue to draw on the ever-increasing pool of world-class recorder professionals residing in the Bay Area to alternate as workshop directors with those who were from out of the area or to serve as guest conductors for MPRO meetings. Expanding the scope of workshops went beyond the choice of directors. Workshop topics had to be original, attractive to a wide audience and feature material that was new and stimulating. The choice of music had to be within the technical capabilities of the average recorder player. Workshop publicity would be well organized, extend throughout the Bay Area and surrounding counties and take maximum advantage of free media coverage and listings by local recorder and early music organizations in their publications. This included the requirement that the workshop director write a short article describing the topic to be presented and why it was important and instructive to those who played recorder. Over the last twenty-five years, MPRO workshops have been successful, overall, well attended and an important asset not only to the members of the orchestra but also to recorder players throughout Northern California and occasionally beyond. Listed below is the music for the orchestra's next three meetings. Please note that there will be sectional seating for the Gabrieli Canzon Septimi Toni, with those in Coro Primo sitting on the right as they face the conductor and those in Coro Secundo on the left. Please observe this seating arrangement when you choose your place at the beginning of the meetings on April 10 and April 24. Please note as well that bass viola da gamba and sopranino recorder will be needed at all three meetings, contrabass recorders and dulcien on April 10 and April 24, krummhorns on April 24 and great bass recorders on April 10 and May 1. Also, I encourage everyone to attend the meetings on April 24 and May 1. Irene Beardsley will be attending the meeting on April 24, and this will be one of the few opportunities to rehearse the music that calls for keyboard with all forces present. Nancy Bloomer Deussen will be attending the meeting on May 1, and this will give the orchestra the chance to benefit from her input on Impressions Around G prior to its performance at the MPRO spring concert on June 1.